Complex lower extremity injuries pose a significant challenge in terms of management especially when the distal leg is involved. This is compounded by the fact that many patients in this environment who sustain fractures present to traditional bone setters before presenting to the hospital often with complications. We present a 26 year old man with severe right leg injury following a road traffic accident who presented to us at Ntasiobi Specialist Hospital, Enugu, Nigeria for amputation through a traditional bonesetter. He had comminuted fractures of the tibia and fibula with periosteal stripping and an extensive soft tissue loss affecting the distal ½ and about ⅔ of the circumference of the right leg. This degree of injury required free flap reconstruction which was not feasible. We used external fixator to stabilize the bones and improvised negative pressure dressing with a delayed distally based posterior calf fasciocutaneous flap for wound cover. The limb was salvaged though with some challenges but patient was satisfied with the outcome. A 26-year-old man presented with a history of injury to left lower limb following a collision of the motorcycle he was riding with a car. There was profuse bleeding but no loss of consciousness. Other parts of the body were not injured. He was first taken to a traditional bone setter who advised him to be taken to the hospital for amputation. Examination revealed a young man who was pale but otherwise stable, with a laceration on the right thigh and an extensive soft tissue loss affecting the distal one-half and about two-third of the circumference of the right leg. There were exposed comminuted fractures of the tibia and fibula, with periosteal stripping. The dorsalis pedis and posterior tibial artery pulsations were absent, but capillary refill was good and planter sensation was intact. 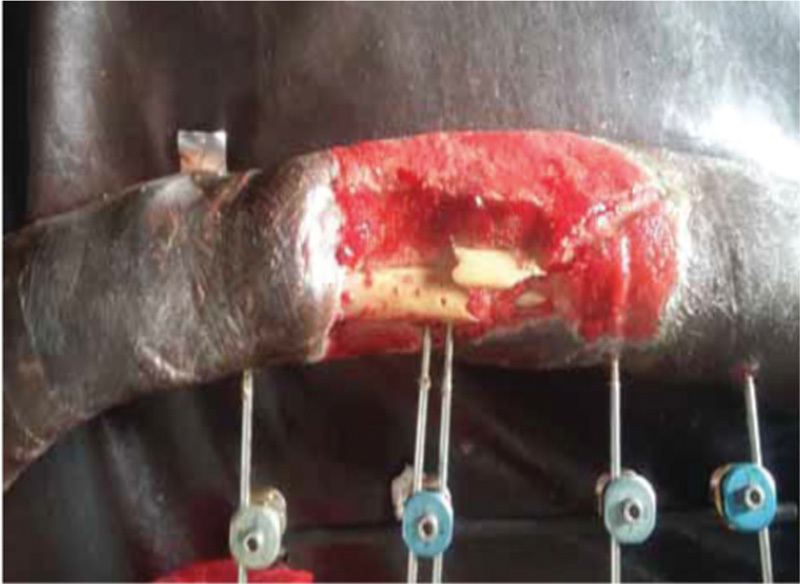 He had initial wound debridement and plaster of paris (POP) backslab application on the 2nd day of admission, and 4 days later, he had a second look debridement and application of external fixator [Figure 1] with delayed primary closure of the thigh wound. He had infection of the leg wound by Staphylococcus aureus and Pseudomonas specie which was treated based on their antibiotic sensitivities. 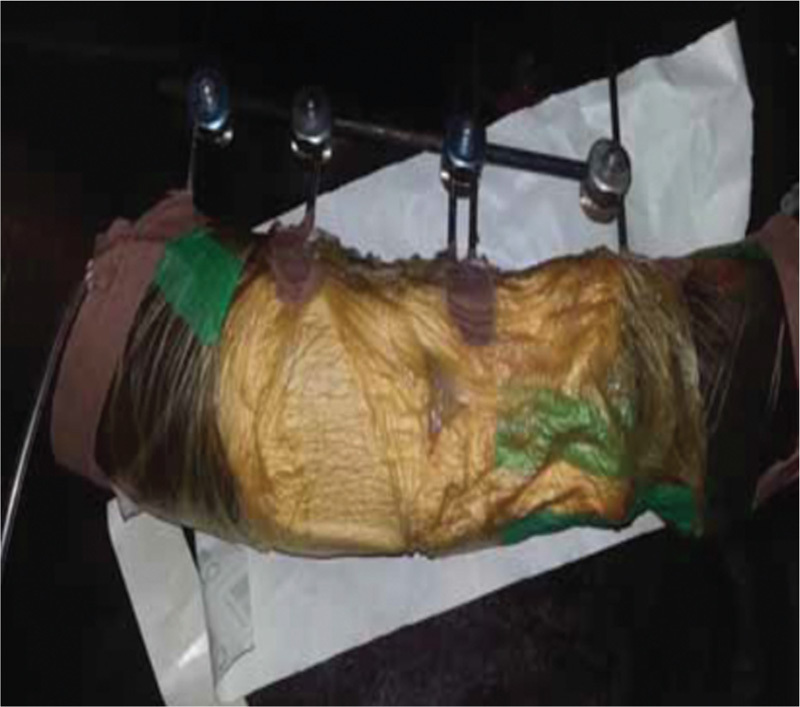 An improvised negative pressure dressing was commenced on the 6th day [Figure 2]. 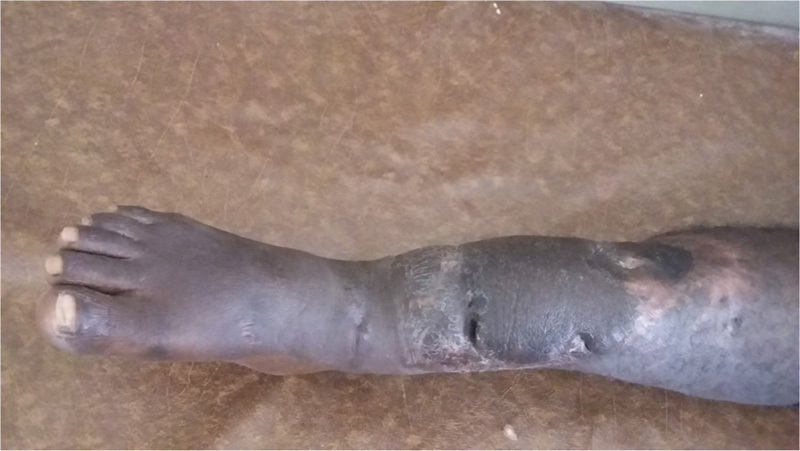 After some weeks of negative pressure dressing, the wound contracted and granulated significantly, but the exposed bone was not covered despite trephination [Figure 3]. The suction apparatus used for the negative pressure dressing broke down, and the procedure was discontinued. He was then worked up for wound cover and had a delayed distally based posterior calf fasciocutaneous flap which was transposed and partly inset 1 week later [Figures 4]. Split skin graft was used to cover the secondary defect. Two weeks postoperatively, the tip of the flap was split and inset astride the external fixator pins on the exposed bone. Wounds healed after few weeks of dressing and external fixator was removed. He was discharged with above-knee plaster of paris and nonweight bearing crutches after about 6 months of admission. He was followed up for more than 1 year [Figures 5], can bear weight with the limb and is satisfied with the outcome. Mangled extremity has been variously defined as a limb with an injury to at least three out of four systems (soft tissue, bone, nerves, and vessels), a complex fracture with additional involvement of at least two of the following: artery, tendon, nerve, or soft tissue (skin, fat, and muscle) or an injury to an extremity so severe that the viability of the limb is often questionable, and the loss of the limb is a likely outcome., Our patient’s injuries fit into the last two. The decision to amputate or salvage the limb is not usually an easy one. 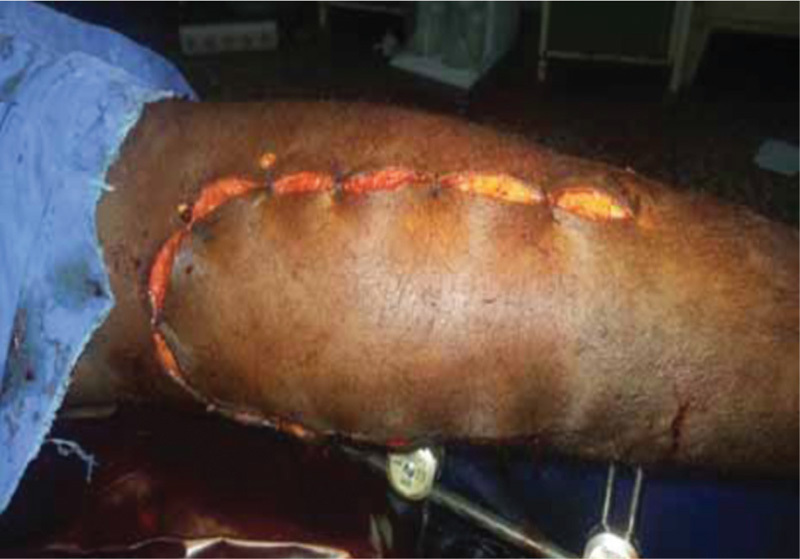 Although amputation may be a nightmare for the patient, limb salvage may entail prolonged hospital stay, multiple surgeries, or nonfunctional limb, and failed attempt to salvage the limb might result in increased morbidity or mortality. Numerous lower extremity injury severity scoring systems have been developed to assist surgeons in deciding whether to amputate or perform limb salvage. These scoring systems have not been shown to be good predictors of limb amputation or salvage.,, The decision to amputate or salvage has to rely on the experience of the surgical team and available facilities. With advances in trauma care and reconstructive techniques such as free flaps, limbs that would have been amputated are now being salvaged., However, in environment with limited resources such as ours, attempts at salvage still pose a significant challenge. This is compounded by the preference by a good number of our people to patronize traditional bone setters., This often predisposes to infection which jeopardizes efforts at salvage. Our patient was first presented to a traditional bone setter as it is the usual practice in this environment. He was, however, advised to be taken to the hospital for amputation which is in line with an erroneous belief that injured limbs that present to hospitals are amputated. Fear of amputation has been documented as one of the reasons why traditional bonesetters are being patronized. Our patient had Anderson type IIIB open tibial fracture with extensive soft tissue loss of two-third of the circumference to the leg including the muscle and tendons of the anterior compartment. This degree of injury required free flap reconstruction. However, free flap reconstruction requires microvascular expertise and facilities, availability of viable recipient vessel, and has potentials for prolonged surgery and possible failure., Cross-leg flap is another option, but its use can be limited by the incidence of necrosis, difficulty of immobilizing the both legs for 2 to 3 weeks, joint stiffness, chances of thromboembolism, and concern about donor site cosmetic deformity. Besides, with a large defect in our patient, cross-leg flap would not have been able to provide cover without exposing vital structures in the normal limb. In the initial management of the patient, we chose the locally modified negative pressure wound therapy (NPWT) which has been shown to be as effective as patented ones but cheaper. NPWT is known to prevent wound infection, protect exposed bone from dessication, and promote granulation tissue formation., Although there were challenges such as frequent power outage and breakdown of the suction machine, we still had marked improvement in the wound. Definitive cover was provided with a delayed distally based posterior calf flap. This flap was originally described as a two-stage procedure without delay involving raising the flap and its division to cover ankle defect in a setting of complete soft tissue envelop in the leg. Its use in a setting of extensive soft tissue loss as in our patient (distal one-half and anterior two-third) has not been described as it is a precarious flap in such setting. However, we did not have more viable options, and we had to use delay technique to improve the chances of flap survival. The limb was salvaged, and patient is satisfied with the outcome as he ambulates without much limitation. 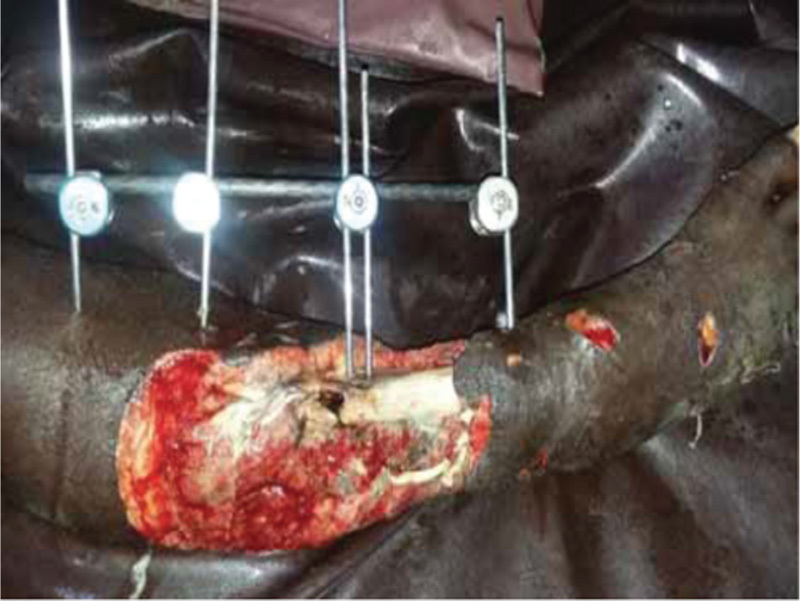 This case demonstrates that limb salvage is feasible even amidst adverse working conditions. Efforts to salvage can be rewarding and should be pursued where possible. Bhatti AZ, Adeshola A, Ismael T, Harris N. Lower leg flaps comparison between free versus local flaps. Internet J Plast Surg 2007;3:2. Gill NA, Hameed A, Sajjad Y, Ahmad Z, Rafique Mirza MA. “Homemade” negative pressure wound therapy: Treatment of complex wounds under challenging conditions. Wounds 2011;23:84-92. Aderibigbe SA, Agaja SR, Bamidele JO. Determinants of utilization of traditional bone setters in Ilorin, North Central Nigeria. J Prev Med Hyg 2013;54:35-40. Joseph Sina O, Taiwo OC, Michael Ayodele I. Traditional bone-setters and fracture care in Nigeria. Merit Res J Art Soc Sci Humanit 2014;2:074-80. Prasarn ML, Helfet DL, Kloen P. Management of the mangled extremity. Strategies Trauma Limb Reconstr 2012;7:57-66. Sinclair SK, Kubaik EN. Principles of mangled extremity management. In: Toretta P, Court-Brown C, Heckman JD, McKee M, McQueen MM, Ricci W, et al., editors. Rockwood, Green and Wilkins fractures in adults and children. 8th ed. Philadelphia: Wolters Kluwer Health Adis (ESP); 2014. pp 429-48. Ly TV, Travison TG, Castillo RC, Bosse MJ, MacKenzie EJ. Ability of lower-extremity injury severity scores to predict functional outcome after limb salvage. J Bone Joint Surg Am 2008;90:1738-43. Schirò GR, Sessa S, Piccioli A, Maccauro G. Primary amputation vs limb salvage in mangled extremity: A systematic review of the current scoring system. BMC Musculoskelet Disord 2015;16:372. Agarwal P, Raza HTK. Cross-leg flap: Its role in limb salvage. Indian J Orthop 2008;42:439-43. Isiguzo CM, Ogbonnaya IS, Uduezue A. Modification of negative pressure wound therapy in the economically constrained region; a preliminary report. Niger J Plast Surg 2012;8:39-43. Le Nen D, Hu W, Lefevre C. Posterior calf fasciocutaneous flap with distal pedicle to reconstruct ankle defects. In: Strauch B, Vasconez LO, Hall-Findaly EJ, editors. Grabb’s encyclopedia of flaps (3 vols). 2nd ed. Philadelphia: Lippincott-Raven 1998. pp 1875-7.